Those expecting that they’ll have to work within a tight budget will love the Toro 51619 Ultra Electric Blower/Vacuum. 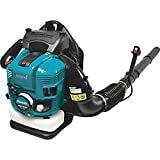 Indeed, being sold for on Amazon with free shipping, this leaf blower is one of the best leaf blowers under $100.00 that are currently available in the market, which, to be sure, makes it more affordable than the other leaf blowers on this list. But this doesn’t mean the leaf blower would be inferior compared with the others. In fact, it comes with a wide array of useful features that make it truly effective. To begin with, coming in at no more than 10 lbs (about 8.5 pounds), the Toro 51619 Ultra 12 amp Variable-Speed (up to 250) Electric Blower/Vacuum with Metal Impeller is one of the two lightest leaf blowers on this list, assuring you that this one will be easy to move around and use. As such, using it to keep your lawn and/or garden looking as beautiful as possible will be quite easy and enjoyable. The useful features of the Toro 51619 Ultra Electric Blower/Vacuum with Metal Impeller don’t stop at its being quite handy. To be specific, this leaf blower comes with several other useful features that enable you to maintain your lawn and/or garden most effectively. First, and foremost, the leaf blower comes with a variable speed 12 amp motor that can blow out air at any speed up to 250 mph, and enabling you to set the device to a low speed in order to clear hard surfaces and clean up tight areas while avoiding making an even bigger mess and decreasing the device’s effectiveness. The device can also maintain a maximum air volume of 410 cfm, enabling you to easily move a substantial volume of debris around or out of your lawn and/or garden. If you’d worry that the leaf blower might be too much for you to handle, don’t, because it comes with 2 different air concentrator nozzles that allow you to adjust the air volume the device generates: the power insert enables you to move debris into ‘wind rows’, which enable you to pile up debris easily; while the concentrator insert enables you to move debris out of cracks and edging, which makes the device truly effective. The main tube would be most effective in moving debris around or away from your lawn and/or garden. The rest of the useful features of the leaf blower are: metal impeller, which not only enables you to use the device to mulch debris easily and effectively, but also ensures the device itself can last for several years; quick-release latch that enables you to easily convert the device into a leaf blower and then a leaf vacuum once again; and hook for convenient storage of the device’s electrical cord. The only minor complaints aired about the Toro 51619 Ultra is that some customers find it difficult to use for mulching a stack of leaves and a small yard of waste at the same time. Nevertheless, the leaf blower received a rating of 4 and a half stars out of 5 on Amazon. As one of the best electric leaf blowers currently available in the market that are regarded as among the best leaf blowers 2014 as well, the feature of the Black and Decker LSWV36 40V Lithium Ion Sweeper/Vac that we believe deserves to be taken note of first is its being surprisingly light. Coming in at 6.9 lbs (11 lbs when shipped), not only is this leaf blower the lightest leaf blower on this list, but we trust it’s lighter than several of the other leaf blowers currently available in the market, making it more easier to move around and use than any leaf blower you’ve used already. 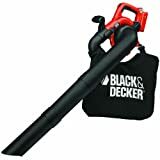 The feature of the Black and Decker LSWV36 40V Lithium Ion Sweeper/Vac leaf blower that makes it so light is its powerful, cordless, and rechargeable Black & Decker 40-volt lithium power source. Compared to gas-powered engines, this power source is lighter, produces less noise and smoke; and can run and last longer. The useful features of the Black and Decker LSWV36 40V Lithium Ion Sweeper/Vac don’t stop at it being quite handy. To be specific, it comes with a wide array of useful features that make it a truly effective lawn and garden maintenance tool. These features are: blower tube with built-in scraper, which enables you to easily loosen and dispose of tough debris, like matted leaves; ‘Power Command’ function that enables you to control the speed at which the leaf blower blows out air, for maximum run time or maximum power; and design that makes the leaf blower easily convertible into a leaf blower and then back into a leaf vacuum, which makes using the device truly convenient. The rest of the useful features of the leaf blower are: ability to generate a maximum air speed of 120 mph, assuring you that the device can deal with debris—even tough debris—effectively; soft-grip handle; easily attachable half-bushel bag; fast recharge time of more or less 1 hour; and operating instructions. Despite the surprising usefulness of the leaf blower, a small number of consumers have noted a few drawbacks to this device. Their complaints are: the device isn’t as powerful as expected; the impeller is made of plastic, making it unlikely this part of the device can last long, which means it’s likely the device itself can’t last long either; the air intake was designed on the side of the device, which means it’s likely you’ll be keeping your clothes from getting sucked into it while you use the device, making using the device itself somewhat of a pain; the electric cord will limit your reach; the half-bushel bag is small. However, the device’s price is affordable without the battery but you can also buy this with the battery already included with free shipping on Amazon. The leaf blower also received a rating of 4 stars out of 5 on Amazon. If you’d like a powerful leaf blower, the Husqvarna 350BTS 50.2cc 2-Cycle X-Torq Gas Powered 180 MPH Backpack Blower may very well be the beat leaf blower for you among the best leaf blowers 2014. With a 50.2cc x-torq engine that can blow out air at a maximum volume of around 500 cfm at a maximum speed of 180 mph, this leaf blower is not only one of the best gas leaf blowers currently available in the market, but it’s also the most powerful leaf blower on this list, and most likely more powerful than several of the other leaf blowers currently available in the market. If you’d worry that this leaf blower might buck like a wild bronco while you use it, don’t, because it’s designed to truly be easy and enjoyable to use despite its power. Not only does the leaf blower come with sturdy shoulder straps, but it also comes with an ergonomic handle. The rest of the useful features of the Husqvarna 350BTS Backpack Blower are: integrated harness that’s ventilated and helps reduce load with a hip belt that’s shaped to fit the contours of the operator and wide shoulder straps, side-vented frame, high fuel efficiency and low emissions. While the Husqvarna 350BTS 50.2cc 2-Stroke X-Torq Gas Powered 180 MPH Backpack Blower appears to be quite a useful leaf blower indeed, a few customers have some minor complaints about it. One says he found his model heavier than he would like. Another says his model was so noisy that he recommends other users to wear ear protection while using theirs. Another says the instructional manual he received was riddled with errors. The leaf blower, however, received a rating of 4 and a half stars out of five on Amazon. If you’re looking for a leaf blower that will be most convenient to use, the Makita BBX7600N 75.6 CC 4-Stroke Backpack Blower may very well be the one. As one of the best backpack leaf blowers currently available in the market, we believe that this leaf blower can go toe to toe with the leaf blowers reviewed previously and even in terms of convenience of use. Now, the convenience of use that the Makita BBX7600N 75.6 CC 4-Stroke Backpack Blower gives doesn’t mean it falls short in power. We assure you, this leaf blower can generate enough power for keeping your lawn and/or garden debris-free. It comes with a 75.6 cc, 4-stroke, commercial-duty engine that enables the device to blow out air at a maximum volume of 526 cfm at a maximum speed of 195 mph. The Makita BBX7600N 75.6 CC 4-Stroke Backpack Blower isn’t just a handy powerhouse; this leaf blower comes with a wide array of features that make the device a truly effective lawn and garden maintenance tool. These features are: ‘decompression system’ that makes starting the device quick and easy; longer run time; large-capacity air filter, which not only improves dust control, but also enables the leaf blower to last for several years; and quieter operation, low fuel, and oil consumption compared with several of the other leaf blowers currently available in the market. The rest of the useful features of the leaf blower are: easily accessible oil-filling port and drain plug, as well as wide, padded shoulder straps and padded, ventilated back panel, which assures you that you’d be comfortable carrying around the lawn and garden maintenance tool. The only minor complaints aired online about the leaf blower is its hefty price tag and its straight blower tube, which made blowing away debris from hard-to-reach areas even harder. But the leaf blower received a high rating of 4.8 out of 5 stars on Amazon. Having been given these detailed reviews of 4 of the best leaf blowers for 2014, we hope to help you begin planning to make your loved ones happy as early as now by gifting them with the best lawn and garden maintenance tool for them. Do you think that there are leaf blowers missing on this list that should’ve made our cut? Tell us about them. We would love to hear from you.